The latest update to Overwatch's Public Test Region brought a host of fresh features and changes, the most dramatic among them being the Symmetra rework. The Overwatch team has changed her kit drastically, moving her from the support category to the newly-minted damage group. Here's everything you need to know about the deadly new Symmetra. Symmetra has always been attacked for being "low skill," at least in part because of her primary fire's ability to automatically lock onto targets. Blizzard's done away with the lock-on system, but Symmetra has received a serious damage boost to compensate for that loss. As she lands more shots, Symmetra's damage increases, making her a serious threat in the hands of an accurate player. In the past, Symmetra's right clicks would phase through barriers and heroes alike, causing significant cleave damage whenever it landed. Thanks to its lazy flight speed, however, that damage was a rarity. Now, Symmetra's right clicks are speedier and explode on impact, causing contact and splash damage. They also charge more quickly, making it easier to spam into a choke and deal serious damage to clumped up enemies. Where Symmetra used to have to place all six turrets individually, she can now launch her three turrets across the map, and they'll stick to whatever surface they reach first. They also deal more damage and slow even more, giving her more damage output in sticky situations. Previously, Symmetra's Photon Barrier was a puny floating shield just big enough to protect her as she charged an enemy, contributing little to the team effort. To fix that, Blizzard moved her barrier to her ultimate, and holy moly is it huge now. With the new shield, Symmetra will be able to protect her team better than ever. Teleporter has been downgraded from an ultimate to a basic ability, but it may be even more useful than ever. 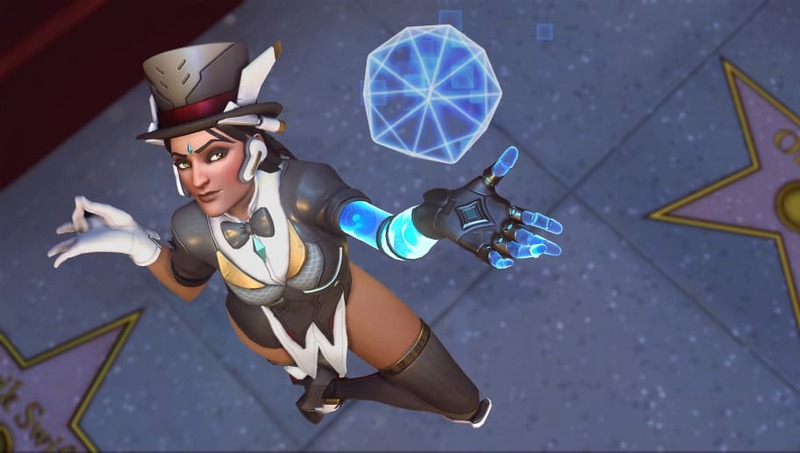 Instead of placing it right in front of her, Symmetra projects the teleporter 10 meters ahead, allowing her to toss out clutch teleports to allies in danger and pull of trick combos with teammates.